The ever increasing national, racial and ethnic diversity of present-day London. The Anatolian Cultural Fête is a four-day event offering numerous attractions, including Turkish oil wrestling, an Ottoman marching band, shadow puppet shows and theatrical plays with live actors too. Very large crowds attend and many people wear traditional dress. Richard ran into Pious one Sunday morning near Brick Lane. They had a few laughs. Pious likes a laugh. Richard asked him if he could take his picture and told him that he had the most wonderful face. This made him laugh even more. So the picture came out well. These ceremonies are important occasions for the Sikh community in Southall. Many of the area’s streets are closed to traffic for the day as a massive procession crawls slowly round. You can see some pictures of it in the Faith in London section. From early in the morning, stalls all round the area hand out free food to everyone. No bus is going to be stopping at this shelter for the rest of the day and so it’s a useful place to sit and enjoy a plate of curry and rice from one of these stalls. The Bromley by Bow Community Centre offers many facilities. One of these is to help new immigrants acquire some English. Once a year, there’s an Adult Learner Day Certificates Picnic in the Centre’s park. The women in this photograph had attended an English class. All but one were fairly recent immigrants from Bangladesh. Everyone had passed and, perhaps even more impressively, they’d all been to every single lesson right through the year. Quite justifiably, they were hugely proud of this achievement and, as soon as they’d collected their certificates, they came over and asked Richard if he’d take their picture. Roman Road likes to advertise itself as the heart of the East End. That part of London has, for hundreds of years, been the place where successive waves of new immigrants have first settled when they’ve arrived here. The diversity which has resulted from this history is clearly imprinted on the Roman Road Market. Just before the Olympic Games were held in Beijing in 2008, the Olympic torch was paraded through London escorted by a Chinese guard of honour. One of the stops that it made was in Downing Street and very large crowds gathered in Whitehall to see it. This triggered off widespread demonstrations against the Chinese presence in Tibet. 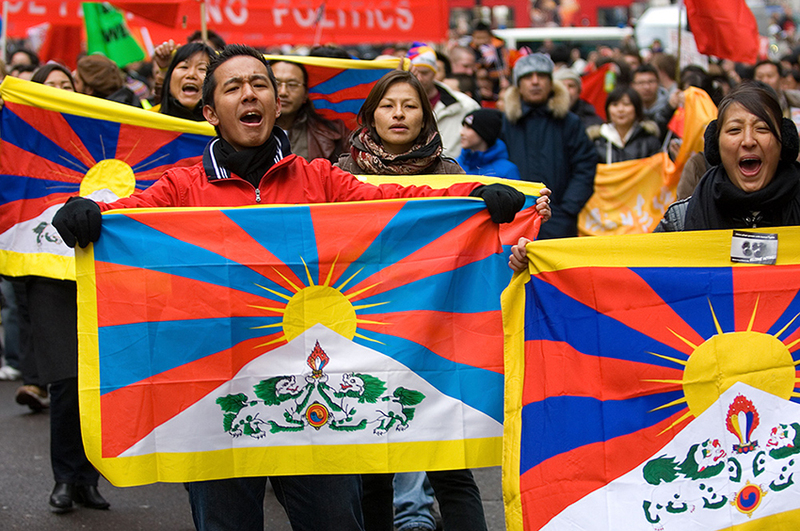 The Tibetan flag, which was the focal point of the protests, was everywhere that day. In the queue outside the Royal Albert Hall for the Last Night of the Proms, everybody had Union Jacks, George Cross flags, red, white and blue dresses, face paint and the other paraphernalia that you usually associate with football fans walking up Olympic Way before an England game at Wembley. All that was missing was the chanting and singing that you get outside Wembley. ‘Land of Hope and Glory’ is confined to the inside of the Royal Albert Hall. It’s very much to its credit that the Italian Church in Clerkenwell can persuade teenagers and children to dress up in biblical costumes and parade through London’s streets, where they might easily be spotted by more cynical classmates and friends. But significant numbers turn out every year look like they’re having fun. Naw Ruz is the Iranian New Year and it falls on the first day of Spring, which is 21 March. It’s a festival day for Bahá’ís too and they meet to pray, enjoy some music, dancing and other entertainment and to have a New Year’s Day feast. I was there to photograph this Bahá’í celebration and this little girl caught my eye. Her mother told me that this was traditional Russian dress. The stretch of Edgware Road from Marble Arch up to Marylebone Road has a distinctly Middle Eastern feel. Many of the shop signs are written in Arabic and that’s the language that you hear spoken. The food in the restaurants and supermarkets is mostly Middle Eastern, and there are lots of pavement cafés that open late into the evening. The smell of hookahs is everywhere. It’s traditional at the Notting Hill Carnival for people from the West Indies to make an event of which island their families come from. One of the ways to do that is to have an outfit in the national colours. The fantastic head-dresses, costumes and make-up in this photograph are in the colours of Jamaica. The organisation Refugee Week arranges regular umbrella parades in cities all over the country. This photograph is from the London event in June 2011 and had special significance as it marked the 60th anniversary of the UN Convention on Refugees. The umbrellas symbolise shelter for people whose lives are in danger and who seek asylum. And the bright colours were chosen to represent the diversity of the refugees.